Using SST, fix the pulley and loosen the bolt. Using SST, remove the bolt and pulley. (a) Install the engine hanger No. 1 and No. 2 with the bolts as shown in the illustration. 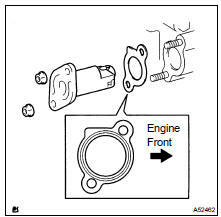 (a) Remove the stud bolt for the drive belt tensioner from the cylinder block. (b) Remove the 14 bolts and 2 nuts. 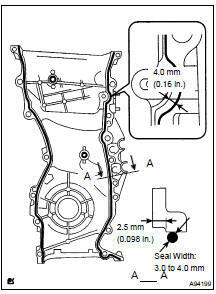 (c) Pry out the timing chain cover with a screwdriver. 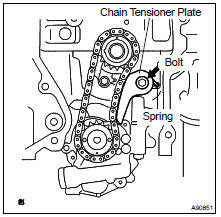 NOTICE: Be careful not to damage the contact surfaces of the timing chain cover, cylinder block and cylinder head. 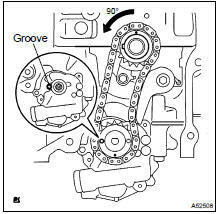 (a) Turn the crankshaft counterclockwise 90 , and align an adjusting hole of the oil pump driven sprocket with the groove of the oil pump. (b) Put a bar (f 4.0 mm (0.16 in.)) in the adjusting hole of the oil pump driven sprocket to temporarily lock the sprocket in position. Remove the nut. (d) Remove the chain tensioner, oil pump driven sprocket and chain. (a) Set the crankshaft key into the left horizontal position. 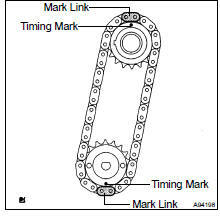 (c) Align the mark links (yellow colored links) with the timing marks of the sprocket as shown in the illustration. (d) Insert the sprockets with chain to the crankshaft and oil pump shaft. (e) Temporarily tighten the oil pump driven sprocket with the nut. (f) Insert the damper spring into the adjusting hole, and install the chain tensioner plate with the nut. (g) Align the adjusting hole of the oil pump driven sprocket with the groove of the oil pump. (h) Put a bar (f 4 mm (0.16 in.)) in the adjusting hole of the oil pump driven sprocket to temporarily lock the sprocket in position. Install the nut. (i) Rotate the crankshaft counterclockwise 90 , and align the crankshaft key to the top. (a) Set the No.1 cylinder to TDC/compression. Align the timing marks of the camshaft timing sprockets and bearing caps (No. 1 and No. 2). Using the crankshaft pulley bolt, turn the crankshaft and set the set key on the crankshaft upward. (b) Align the mark link (gold or orange colored link) with the timing mark of the crankshaft timing sprocket. (c) Using SST, tap in the sprocket. 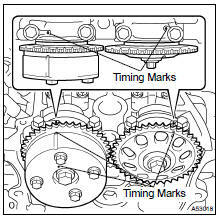 (d) Align the mark links (gold or yellow colored links) with the timing marks of the camshaft timing gear and camshaft timing sprocket. Install the chain. Install the chain cover within 3 minutes after applying seal packing. (a) Remove any old packing (FIPG) material and be careful not to drop any oil on the contact surfaces of the timing chain cover, cylinder head and cylinder block. 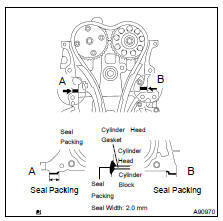 (b) Apply seal packing in a continuous bead (seal width: 2.0 mm (0.079 in.)) as shown in the illustration. (c) Apply seal packing in a continuous bead (seal width: 3.0 to 4.0 mm (0.12 to 0.16 in.)) as shown in the illustration. (d) Install the timing chain cover with the 14 bolts and 2 nuts. (e) Install the stud bolt to the drive belt tensioner. (a) Install the crankshaft pulley. Align the pulley set key with the key groove of the pulley, and side on the pulley. Using SST, install the pulley bolt. HINT: Apply a light coat of engine oil to the bolt threads and the area beneath the bolt heads that come in contact with the washers. (a) Release the ratchet pawl, fully push in the plunger and apply the hook to the pin so that the plunger cannot spring out. 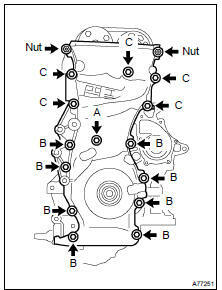 (b) Install a new gasket and the chain tensioner with the 2 nuts. NOTICE: If the hook is released while inserting, apply the hook again, and insert the chain tensioner. (c) Turn the crankshaft counterclockwise and check that the plunger knock pin is disconnected from the hook. (d) Turn the crankshaft clockwise and check that the slipper is pushed by the plunger.